You use the AConfig Utility to configure TT Gateway parameters as well as global TT system parameters common to all TT Gateways. The TT Gateway stores these parameters in a file called aconfig_local.xml. To access the AConfig Utility, on the Desktop double-click the AConfig Utility icon. 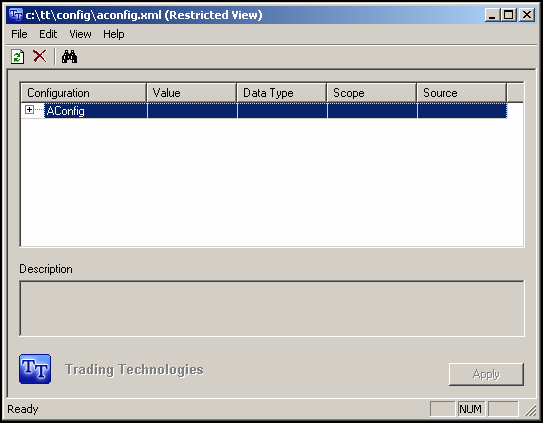 On the Desktop, double-click AConfig Utility. The AConfig Utility window displays. For a description of this window’s columns, refer to . In the Configuration column, navigate to the location of the parameter whose value you want to edit. Instead of navigating to a parameter, search for it using the binoculars button. Click the configuration parameter whose value you want to change. In the parameter’s row, to access the parameter’s value, click the Value cell. You may need to click the cell a second time before being able to edit its values. Type the new value you want to assign the configuration parameter. The value of this parameter must conform to the Data Type of the configuration parameter. The AConfig Utility writes all changes to the appropriate file (aconfig.xml or aconfig_local.xml). Repeat Steps this step - this step until you set all parameters you want to configure. Restart any TT application affected by the changes you made. If you are unsure about which TT components were affected, restart the machine. The following table lists and provides a description for each of the columns in the AConfig Utility. Displays the names of the parameters contained in the aconfig.xml and aconfig_local.xml file. Displays the value assigned to the configuration parameter. This is the only configurable column. string: Any string of alphanumeric characters. int: Any positive or negative numeric character. Decimals are not acceptable. global: The parameter is used by all machines in the TT Trading System. The configuration parameter is located in the aconfig.xml file. local: The parameter is used only on the local machine. The configuration parameter is located in the aconfig_local.xml file. schema default: The value is dictated by TT’s architectural schema as stored in aconfig.xml. file: The value has been changed from its default setting and is stored in aconfig_local.xml. Note that any values set during installation will display file in the Source column.